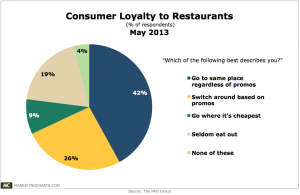 Daily Deals vs Loyalty Programs - What Influences Consumers? Last week my blog shared some stats about millennials and their retail purchases. This week I have some stats to share for our restaurant clients. Check out this chart from Marketing Charts. I found it interesting that 42% of consumers go to the same place regardless of promotion. I actually thought it would be lower than that. So for these 42% the key is their customer experience and being top of mind. They are not the deal watchers, they just like to go out to places where the food is good, the service is good and is may be convenient or a nice place to be. They are not proactively checking to see if there is a daily deal, or if there are special offers. But does that mean they are not influenced by the text or email they receive from a favorite restaurant? Any communication you have with them puts your restaurant top of mind – even if they don’t remember the offer or use the offer. Although they are not looking for deals, they do appreciate being appreciated for their business. So inviting this group to be part of a loyalty program lets you show appreciation and will keep your restaurant top of mind when it comes to the last minute question – Where should we go to dinner tonight? The 26% who switch around based on offers are also perfect for your loyalty program. They will look forward to the birthday offers, reward reminders, missed-you promotions. They still want quality and that is a key factor on their choice for a restaurant. So no matter how good the deal is, the quality needs to be there to make this group a loyal customer. The final group is the 9% who go for the cheapest. Price is the driving factor and the impact on your profitability is not positive. So these consumers need to be amazed by the experience in order to get them past their “go for the cheapest” mindset. 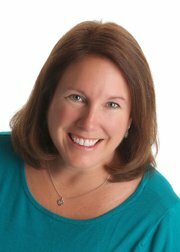 This is not easy to do – so most of this group will be the segment that you won’t want to intentionally target. What does that mean to your bottom line? Say a consumer currently comes to your restaurant 12 times a year. If you implement a rewards program that could increase to 16 times a year. Value of the relationship goes up significantly. You only need 16 clients to increase visits by 35% in a year to offset the cost of a complete rewards program from Tecmark with email and text communications. Just imagine the impact and difference to your bottom line. So if you love your daily deals – also love a loyalty or rewards program so that you can keep the 42% who are not driven by deals coming back to your restaurant – they will be the 20% who provide you with 80% of your profitability!